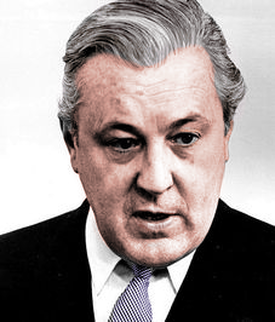 Melvin Mouron Belli photographed in 1967. Click to enlarge photograph. On December 20th 1969, the first anniversary of the Lake Herman Road murders the Zodiac sent a letter to the home address of prominent attorney Melvin Belli asking for his help, claiming he was afraid of 'losing control again and taking his ninth or possibly tenth victim,'. 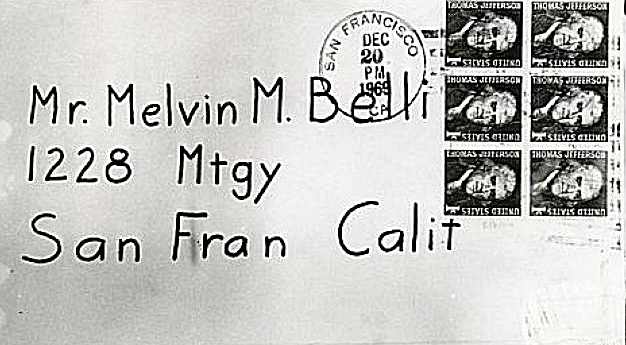 Melvin Belli lived at 1228 Montgomery Street, San Francisco, California. He also included another piece of Paul Stine's shirt to verify its authenticity. ​Melvin Belli had traveled to Munich for a conference on December 20th 1969, so his housekeeper forwarded the letter to his office, where it remained until after the Christmas break. When employees finally returned to work they found the letter and its contents and handed it in to authorities. It was subsequently tested and found to be genuine Zodiac correspondence. Two months earlier on October 22nd 1969 the Oakland Police Department took a call in the early morning hours from somebody claiming to be the Zodiac, requesting that either Melvin Belli or Francis Lee Bailey, high profile lawyers at the time, appear on a chat show hosted by Jim Dunbar later that day . Melvin Belli agreed to appear on the show to which a man would eventually contact via telephone, claiming not only his name was 'Sam', but also by inference that he was the infamous Zodiac Killer. Three people had heard the voice of the Zodiac Killer, including two police dispatchers; Dave Slaight who took the second Zodiac phone call after the Lake Berryessa attack on September 27th 1969 and Nancy Slover who received the first phone call from the killer at 12.40 am on July 5th 1969 from the intersection of Springs Road and Tuolumne, approximately 40 minutes after the attack on Darlene Ferrin and Michael Mageau at the Blue Rock Springs Park in Vallejo. Bryan Hartnell who survived the brutal attack in Napa, became the third and last person ever to hear the Zodiac, all three of which categorically stated that the man called 'Sam', who rang into the Jim Dunbar show was not the same voice they had recalled from the Blue Rock Springs and Lake Berryessa attacks and therefore not the Zodiac. 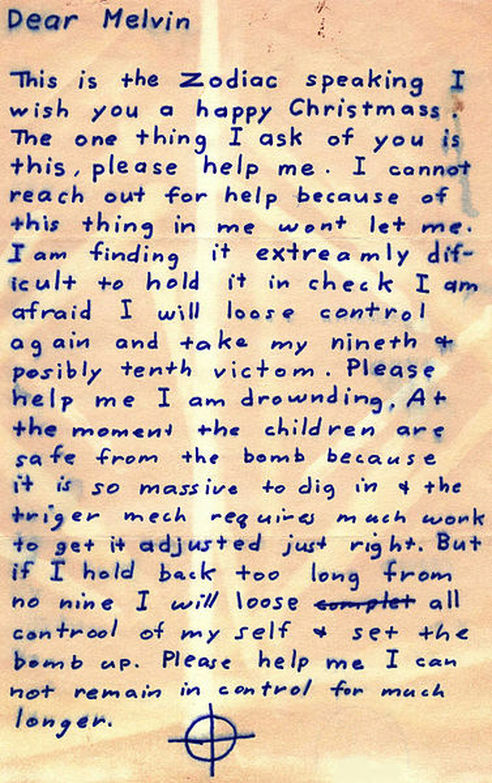 ​In reference to Zodiac of 'losing control again and taking his ninth or possibly tenth victim,' two months after the Melvin Belli letter on Saturday February 21st 1970, John Franklin Hood (24), who had served decorated time in Vietnam in the 64th Armoured Division and Sandra Garcia (20), who worked in the California Department of Motor Vehicles, decided to visit the quiet retreat of East Beach, Santa Barbara one evening, when they fell victim to a knife wielding assassin. The John F Hood and Sandra Garcia murders seem to bear all the hallmarks of the Lake Berryessa attack on Bryan Hartnell and Cecelia Shepard on September 27th 1969, accredited as a confirmed Zodiac event. Both Bryan Hartnell and Cecelia Shepard were stabbed repeatedly without mercy. Although the couple survived the initial attack, Cecelia Shepard succumbed to her injuries two days later at the Queen of the Valley Hospital. John F Hood and Sandra Garcia, were set to become married and were enjoying the evening tranquility, lying on a blanket under a full moon, when a knife-man carrying a bone handled 4" blade approached them, taking them by surprise, and despite evidently fighting back against their attacker, both unfortunately had their lives cruelly snatched away on that fateful night. John Hood suffered 11 stab wounds, the majority inflicted to the face and back, with Sandra Garcia receiving the brunt of the attack, leaving her almost unrecognizable, in what appeared a senseless and motiveless crime. There appeared to be no sexual interference, with their possessions left untouched where they lay. ​On December 28th Paul Avery of the San Francisco Chronicle got in touch with Melvin Belli in Germany, who was understood to have offered his help to the Zodiac, but his gesture fell on deaf ears. Melvin Belli was to remain out of the country for several weeks. The following extract from an FBI file details the 'birthday call' to Melvin Belli's residence. The document is dated 14th January 1970. 1 14 70 RE: SAN FRANCISCO AIRTEL DECEMBER TWENTY NINE LAST. On instant date Insp. (name redacted), Homicide Detail, San Francisco Police Department, confidentially advised that UNSUB, who identified himself as ‘Zodiac,' telephonically contacted attorney Melvin Belli's residence in effort to contact Belli. UNSUB was advised Belli was in Europe and stated, "I can't wait. Today's my birthday." This FBI response​ was regarding a San Francisco Airtel sent on December 29th 1969. Airtel is an outdated data communication process used internally within the FBI, in addition to Teletype and facsimile. It indicates a letter that must be typed and mailed on the same day. In other words this communication is not referring to December 29th being related to the birthday call. The only credible information we can discover regarding the 'birthday call', is that the possible Zodiac rang the Belli residence on or prior to January 14th 1970. The police and FBI have no confirmation the 'Zodiac caller' to Melvin Belli's residence was anything other than a hoaxer and the 'birthday call' is considered by many to be a false lead in respect to the Zodiac case. KPIX Eyewitness News report from October 22nd 1969 by Don Knapp and Rollin Post in San Francisco. Click image for interview with Joe Stine and Melvin Belli. The San Francisco Police Department eavesdropped on future incoming calls to Melvin Belli's home address and traced them to a mental hospital, where patient Eric Weil was subsequently identified as the caller. It was therefore believed that Eric Weil was also responsible for the hoax call to the Jim Dunbar show on October 22nd 1969, but whether the original phone call to Oakland Police Department on October 22nd 1969 calling out Francis Lee Bailey or Melvin Belli, was the real Zodiac or not, we will never know, although it seems highly unlikely. 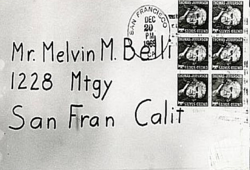 At the foot of the Melvin Belli Letter it appeared that the Zodiac Killer was mimicking lines from a previous crime scene, that of William Heirens, known as the Lipstick Killer, who was convicted of the murders of three females over a seven month period. "GeI $20,000 Reddy & wAITe foR WoRd, do NoT NoTify FBI oR Police. Bills IN 5's & 10's." Later an anonymous phone call was received instructing police to check the sewers and subsequent searches found dismembered body parts of Suzanne Degnan at various locations. 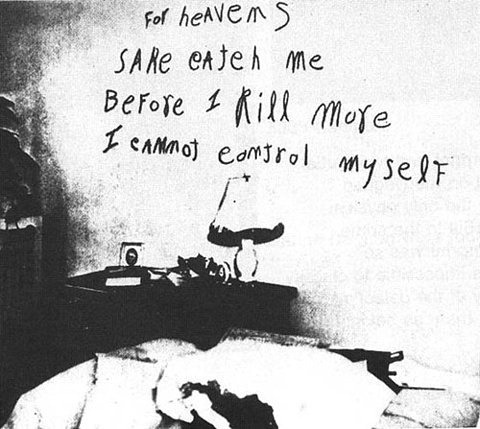 William Heirens confessed to the three murders on August 7th 1946 and spent the rest of his life in prison. He died on March 5th 2012 at the Chicago University of Illinois Medical Center.